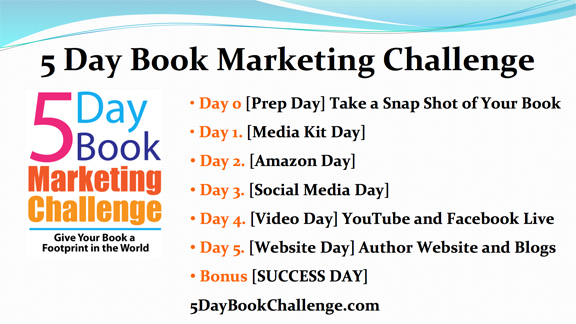 I am is please to announce the release of the 5 Day Book Marketing Challenge for anyone who is trying to market their book. This Challenge is free to all participants and is being held in the How to Publish Your Book Facebook Group. This challenge is designed for authors who currently have a book on Amazon and need to tune up their marketing and give it more life. But also new authors who will find it valuable as they begin to launch their books will find it valuable. Marketing your book is essential for publishing success. The Challenge is being released in Facebook over 5 days plus a Prep Day to a get ready and a Success Day at the end. Starting this weekend, July 29, 2017. The How to Publish Your Group on Facebook now has over 2,000 members and is a great place to meet authors, as questions about self-publishing and launch your books. J. Bruce Jones Is the author and publisher of over 40 books, including the Book Marketing Checklist for Self-Publishing, Available on Amazon. I love teaching other people how to make and publish their own books. There is nothing like seeing an author hold their own new book in their hands.